GameChange Genius Tracker™ System commissioned in Northern Florida – First of 700MW Florida Tracker Build. NEW YORK, NEW YORK – January 31, 2018 - GameChange Solar today announces the completion and commissioning of the first Genius Tracker™ in a series of over 700MW of Florida tracker projects. The projects are expected to be built over the next 18 months utilizing the GameChange Solar Genius Tracker™ single axis tracker system. Some projects will use silicon framed modules and others First Solar Series 4™ modules. 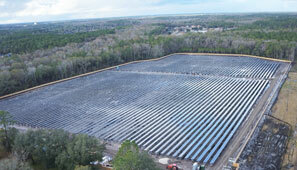 The first system commissioned was in northern Florida and utilized framed silicon modules. Max Johnson, Business Development Director at GameChange Solar, stated: " The Genius Tracker is being adopted at a rapid pace by project owners who are looking for the higher power production typically generated by the System versus alternative systems due to GameChange’s higher module density and wider row spacing. The higher power production combined with bankable quality and value pricing is allowing us to see significant growth nationwide for 2018 and beyond, especially in the Southeast markets."